Eve's Alexandria: Amber = Angel? 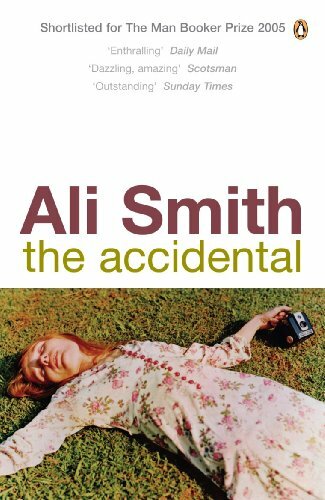 Ali Smith’s The Accidental is such an incredibly sharp novel: sharply worded, sharp witted, sharply delineated and emotionally akin to a shaving of glass. There is nothing soft about it at all. In one of her 5 epigraphs Smith admits to it, having Charlie Chaplin state quite clearly: “My artistry is a bit austere”. I challenge anyone to find a sentimental instant between its covers. Still it gets at you somehow, playfully. I haven’t read any of Smith’s other work, not even the critically acclaimed Hotel World (the LRB reviewer called that “breathtaking”) and so had no idea what to expect from The Accidental. I supposed it must be good, having made the Booker shortlist*, won the Whitbread and been highlighted in relation to any number of other accolades, but I wasn’t expecting what I got. Why did nobody mention that The Accidental is a post-modernist tour de force? Or that Smith writes with such devious fluency and precision? “…my father, surprised, had slipped and grunted into her, presenting her with literally millions of possibilities, of which she chose only one. I am Alhambra, named for the place of my conception. Believe me. Everything is meant. She bursts with similar honest brashness upon the Smarts. They’re spending the summer away from their London home in a “substandard” holiday let in Norfolk with a “summerhouse” (read: shed) where Eve can get over her paralysing writer’s block and where Astrid and Magnus can escape from their respective school dramas. For Astrid the drama is bullying, mostly by offensive text message and mostly by her supposed friends; for Magnus it is more serious. He considers himself partly culpable for the suicide of a classmate - having helped orchestrate the cruel prank that tipped her over into despair – and has withdrawn into a miasma of self-hatred. For Michael it is meant to be break from the intellectual apathy of his tenure as a senior lecturer in English literature, but he insists on travelling back to London for regular and private “supervisions” with the more nubile of his final year undergrads. Into this comes Amber. (We suppose it is Alhambra and Smith confirms this in the final section with a quirky flicker of prose but I shan’t give the detail away). She arrives randomly one morning at their door and is welcomed in: Michael, who greets her, assumes she has come to conduct an interview with Eve and Eve suspects she is Michael’s latest brazen student conquest. Amber, with an astonishing social aplomb, doesn’t disabuse either of their presumptions and is rapidly welcomed into the fold. She throws them off guard, and then she throws the reader off guard; she slips under the narrative, swift as a salmon, with her stopped watch (forever poised at nearly 7 o’clock), her beat-up car and her freakish interpersonal insight. We have no idea where she came from either. She befriends Astrid first, an eccentric nearly-teen who spends her entire time filming the little events of the world – every dawn, local vandalism, other cameras filming her filming them – and who is struggling with the empty identity-space left to her by Adam Berenski, the man who was her father and who she doesn’t remember. She likes filming Amber too, eliding the real world with a “drama of the filmed”, until, that is, Amber throws her £2000 camcorder off a motorway bridge, straight down into the oblivion of the M14. Astrid is nonplussed, angry and, yet, enchanted. Equally Magnus, who, about to hang himself in guilt, is saved by her. She coaxes him down from the side of the bath, strips him and ritually bathes him. And then she seduces him serially, reinventing the whole of his world, bringing his thinking mind down from the heights of guilt and into his groin. Meanwhile she stolidly refuses to offer herself to Michael, who has worked himself into a sexualised frenzy over her, and shakes and berates Eve in her self-indulgent helplessness. And then she leaves, and in a final act of disabusement, takes everything Eve and Michael own, right down to the doorknobs. She literally shatters the Smarts’; she cleans them down and makes them start anew. She is like the angel that wipes the slate clean and frees you from yourself. She is the “accidental” of the title. I was confused about the title at first, my immediate instinct being “the accidental what”? It’s clear that Alhambra isn’t an “accidental” birth. She tells us that herself: “everything is meant”. And nothing she does is “accidental” either. Nominally dropping Astrid’s camera is an “accident”, walking in on Magnus is “an accident” but then again, it isn’t - she ravages the Smarts and their property on purpose. Still, there are other meanings of “accidental”. In biology an “accidental” is a vagrant thing that “appears outside its natural range”; in written music it is a notation used to raise or lower the pitch of a note from that indicated by the key signature. In other words an “accidental” is a liminal thing, and also a thing that sharpens something, brings it into relief or raises the tone: it exercises the note from being what it is to being something else. Which is as close to Amber’s function as can be. Simply put The Accidental is a novel about being galvanised and about what happens afterwards. The Smarts are certainly ripe for galvanisation: white, middle-class, materially very successful and oriented towards liberal but non-political values. Their Britain is the Britain of 2003 – the news, especially the Iraq war, is a constant in the novel – but they’re hardly pro-active in it. Michael and Eve revel in their class prejudices, making fun of the cleaner that comes with the house, calling her Katrina “who-drives-a-Cortina”. In fact, Katrina doesn’t drive a car at all, but a Cortina is typically “low-class” enough for her. Michael feels the need to gloss long words in case she doesn’t understand. Similarly Astrid and Magnus are over-secure in their privileged educations; their assumptions are limiting. In some ways you could think of this as a typical “the-light-dawns” kind of novel, where everyone learns the error of their ways from the baffling stranger. But the end and Amber are too ambiguous for that, and Smith’s writing is too loaded with irony. We can never really take any of her character’s emotional and psychological trials seriously; her prose is loaded with an irony that defies sentimentality. Perhaps Magnus’s trauma in particular is unbelievable. We sense he wouldn’t really have committed suicide and that Amber didn’t really save him. In the same way Eve would probably have overcome her writer’s block, Astrid’s obsession with her father would have passed and Michael’s conquests would have gotten found out eventually. It is a book laughing at its own sincerity. Like I said, there isn’t a soft moment. It is teasing and post-modern with its form in the same way, exercising a good number of narratorial quirks: Michael narrates one of his sections in painfully inept sonnets and Eve imagines her inner narrative as an invasive Q & A. Magnus, a maths student, processes his emotional world as equations (“Amber = angel, if angels = those who save” etc); Astrid peppers her monologue with “grown-up” verbal tics. Smith plays with those linear clichés of narration, but with a fresh energy that gives even the most overused phrases meaning. It thrilled and thrumed, giving me that tingle that comes from reading something honestly funny, patently clever. But there is always that coldness and that brand of postmodernism that negates any real connection with The Accidental’s characters; we’re not allowed anything so straightforward as empathy. We’re supposed to feel discomfort over Amber’s actions and also to see the purpose of them, but we’re not supposed to understand them or really to glory in them. She isn’t really an angel and things are only what they are. It seems to me that the real danger with post-modern material is that the game of being self-reflexive will go too far, will take the magic out of fictionality with its eagerness to examine itself. But Smith is first-rate at what she does; she walks that very fine line between arbitrary and meaningful with brilliant skill. Also, I bought my first book in a month. I actually couldn’t help myself: I saw it in the window, recognised it from my Amazon wishlist AND thought that it was currently out of print (a search on Amazon proves me wrong, but nevertheless…). Don’t laugh. It’s called The Wise Wound: The Myths, Realities and Meanings of Menstruation. I suppose my only defence is that it represents a fascinating cultural artefact? Dismay (or My Disbelief Knows No Bounds): The Guardian reports today that The Competitive Enterprise Institute, a right wing American think-tank (funded, big surprise, by the oil companies), has unveiled a series of TV advertisements aimed at restoring the reputation of green house gases. Yes, that’s right. One states: “The fuels that produce carbon dioxide have freed us from a world of back-breaking labour, allowing us to create and move the things we need and the people we love.” Cue footage of children playing happily in a western utopia, and then a syrupy voice intoning: “Carbon dioxide: they call it pollution, we call it…Life.” You can view both ads at their website and you should...tis frightening stuff. All this in response to Al Gore’s film “An Inconvenient Truth” due to be released next week. Although, in better news, George W. Bush is now the most unpopular mid-term president of all time. And thus the light finally dawns.